Remember back when, about one post ago, when I mentioned Jed Hoffman was chipleader? Well, @JCHAKnv just knocked a player out, added 200k to his stack, caused the table to break and now is at 575,000 early in Level 18 of Day 1 in the WSOP Circuit Monster Stack. 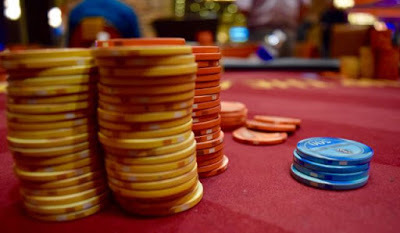 Perhaps the moral of this story is .. have the TVPokerBlog write about your chipstack and run it up afterwards ..